Pro: Six idols fighting over you! Con: They’re all super-powered and violent!! Soda ad: Crazy!!! There’s a pretty common male fantasy in Japan that goes like this: You’re sitting alone in your classroom at lunchtime, when suddenly, a cute female classmate walks up to you. With your heart fluttering and your stomach growling, you find out she’s ready to satisfy both, as she pulls out a bento lunch box filled with homemade goodies and, while smiling sweetly, asks if you’d eat lunch with her. Now take that same scenario, but expand the cast from one girl to six. Even better, right? Sure, at least until you find out that all six of your lady suitors have superpowers and violent streaks, like what happens to this unsuspecting guy in the craziest soda ad we’ve seen in quite a while. 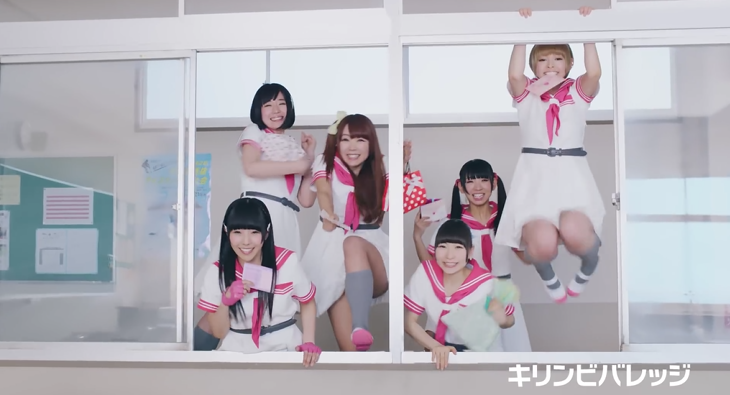 Starring in the ad are the ladies of Dempagumi.inc, a six-member idol unit who’re all self-professed otaku. Dempagumi.inc has arguably won as many fans for their pretty smiles and sunny personalities as they have for their musical skills, so there are probably plenty of guys who’d be happy to hear them excitedly call out to him with “Senpai (upperclassman)!” Still, these girls seem like they might be just a little too enthusiastic seeing as how they’re climbing in through the classroom window instead of sing the door. As it turns out, “enthusiastic” doesn’t even begin to do justice to the gusto they show in their race to be the first to reach their collective crush. But is the ad really as out of control as it seems? Let’s take a look at the lyrics of the song that plas throughout and see if they can provide some sort of context. You can be anything you wanna! We’re the funky spunky younger generation! Get the boys! Get the girls! Nope, not a drop. Still, what the ad lacks in meaning it more than makes up for in energy. All the same, though, we think that if we were in his position, we’d respond to these declarations of love in the exact same way as the guy in the ad.